A small team of rescuers is attempting the impossible – rescuing 161 animals from a facility in Lassen County, Northern California called High Desert Wolves. Originally slated to be destroyed on Monday October 8th, the rescue team, made up of Plan B to Save Wolves, W.O.L.F. Sanctuary of Colorado, Apex Protection Project, Pets Return Home, Wolf Mountain Sanctuary, Omen Creek Wolf Sanctuary and other individuals in the rescue world, has been granted an extension by the county to Friday, November 2nd, to safely remove as many of the dogs from the property as possible before they step in and euthanize the remaining animals. So far, The High Desert Wolves Rescue Team has been able to vet and transport 99 animals to safe havens around the country. With the deadline looming and 37 animals slated for placement pending vetting and 25 still needing placement, time is of the essence and help is desperately needed. The team has spent upwards of $50,000 in donations from around the country for this operation to save 99 animals total to date – many of which are puppies. 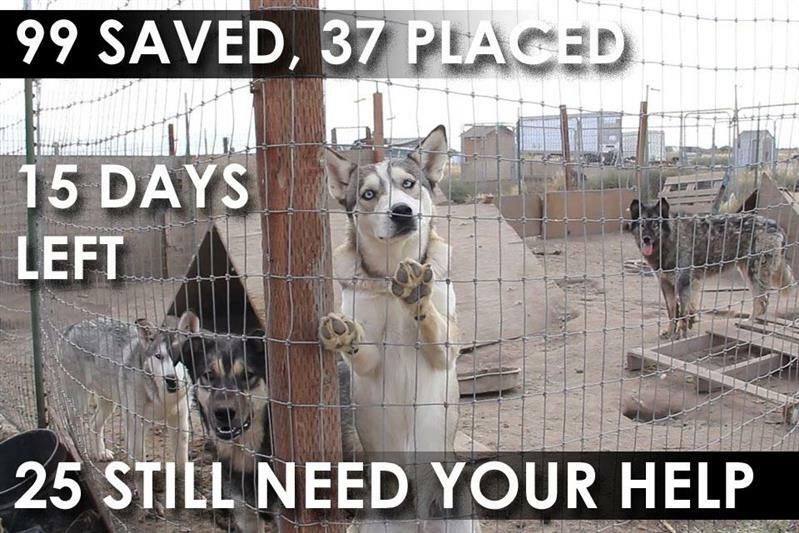 Time is of the essence and they need an additional $75,000 to save the final 62 and supply the rescues taking these animals with continued support including remaining transport, spay/neuter, vetting, properly built enclosures, food and other needs. Placement at Qualified Rescue Facilities equipped to take feral, suspected low-content wolfdogs or northern breed mixes. Those who can take a larger amount of dogs are most needed. Professional transporters who can handle large groups of animals in one transport (10 and more). This is one of the largest rescue operations the national wolfdog rescue community has ever seen. Please support the High Desert Wolves Rescue Team however you can. These innocent lives are worth saving. The Plan B Foundation, Inc. is a 501(c)3 corporation created to support organizations in their mission to protect, preserve and rescue wolves and wolfdogs through advocacy, education and funding. To learn more, visit www.PlanB.Foundation or call 714.478.0353.